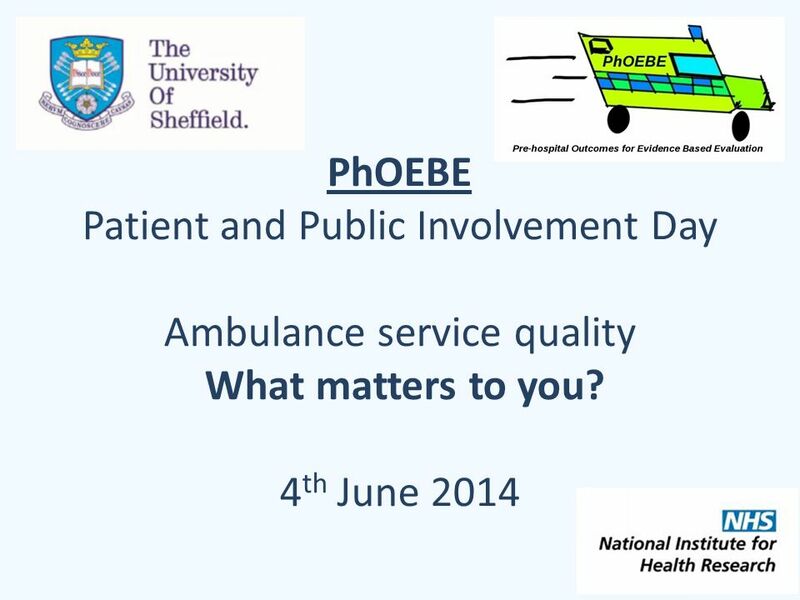 PhOEBE Patient and Public Involvement Day Ambulance service quality What matters to you? 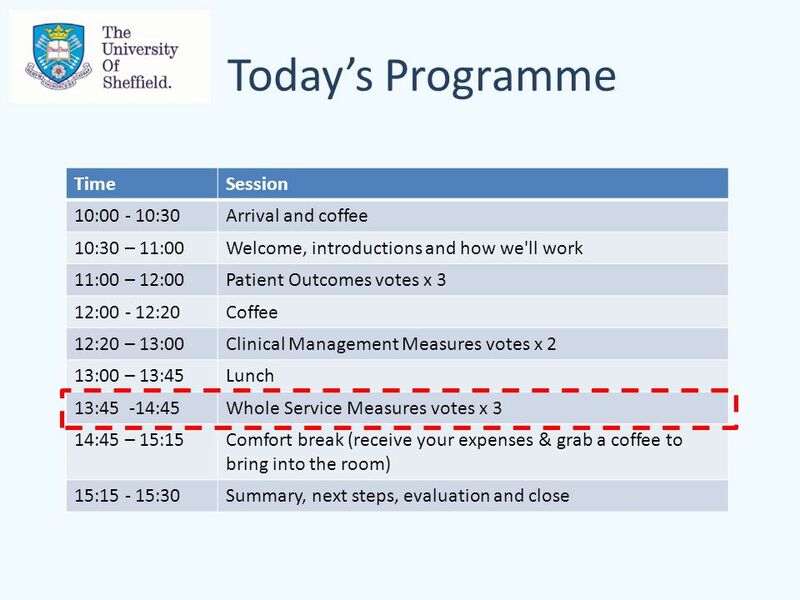 4 th June 2014. 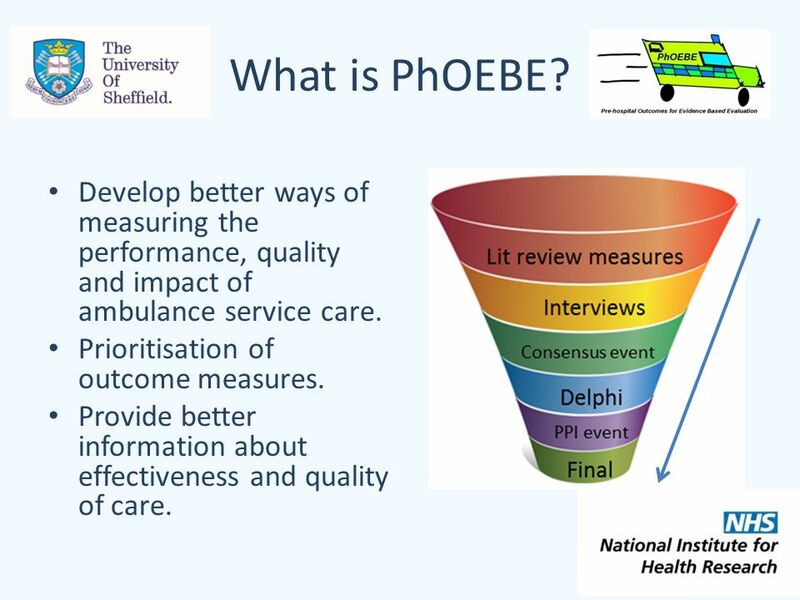 3 What is PhOEBE? 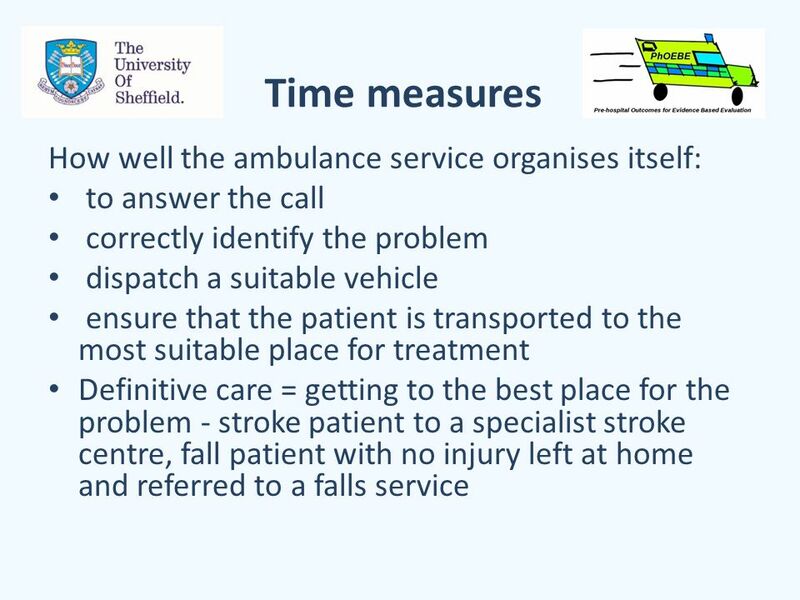 Develop better ways of measuring the performance, quality and impact of ambulance service care. 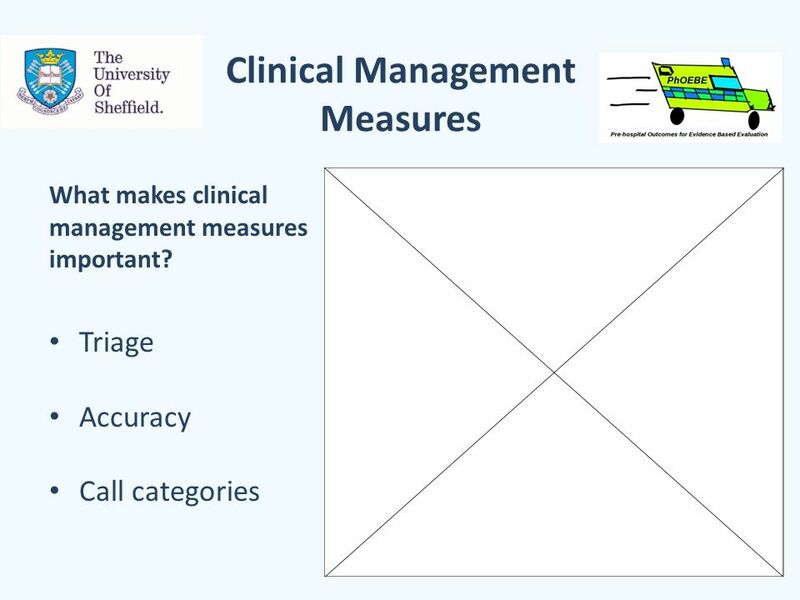 Prioritisation of outcome measures. 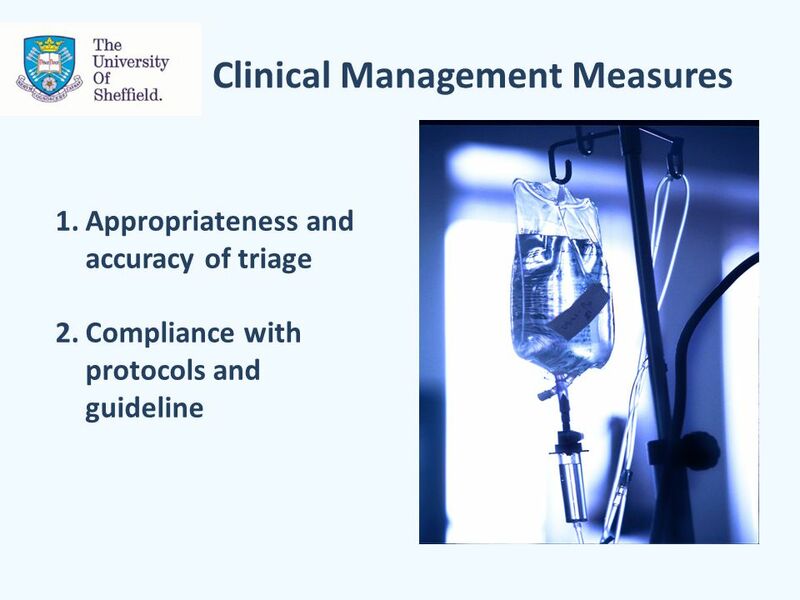 Provide better information about effectiveness and quality of care. 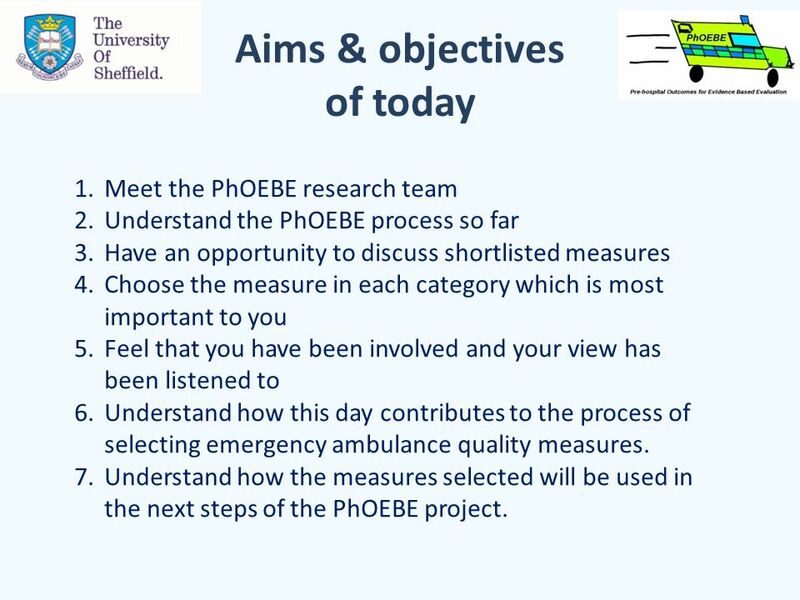 6 Aims & objectives of today 1.Meet the PhOEBE research team 2.Understand the PhOEBE process so far 3.Have an opportunity to discuss shortlisted measures 4.Choose the measure in each category which is most important to you 5.Feel that you have been involved and your view has been listened to 6.Understand how this day contributes to the process of selecting emergency ambulance quality measures. 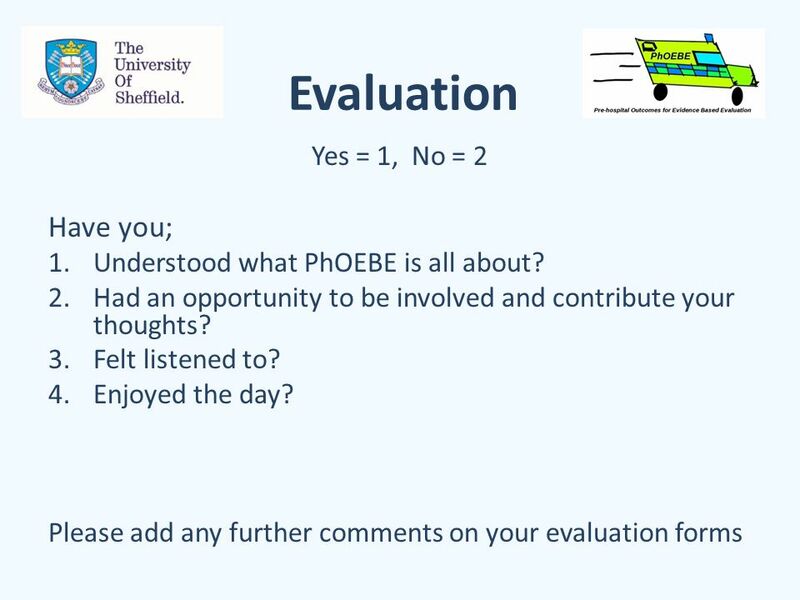 7.Understand how the measures selected will be used in the next steps of the PhOEBE project. 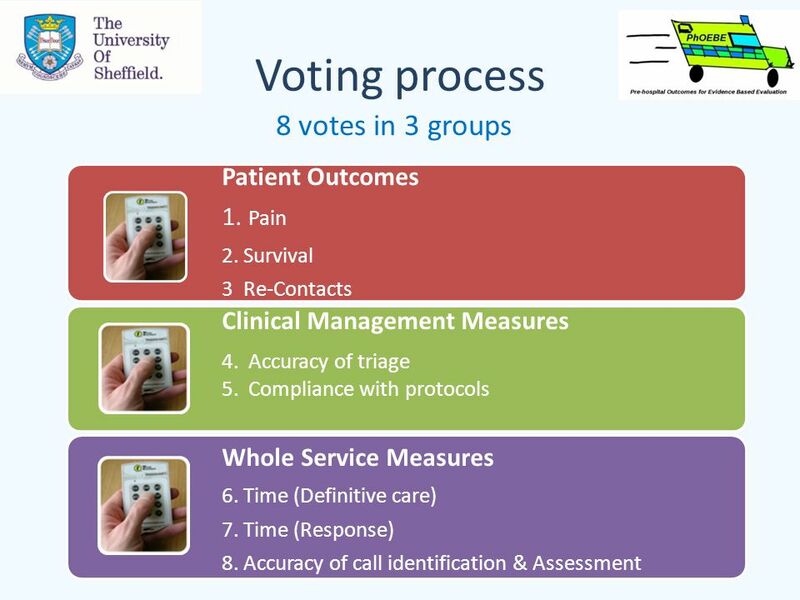 9 Voting test! 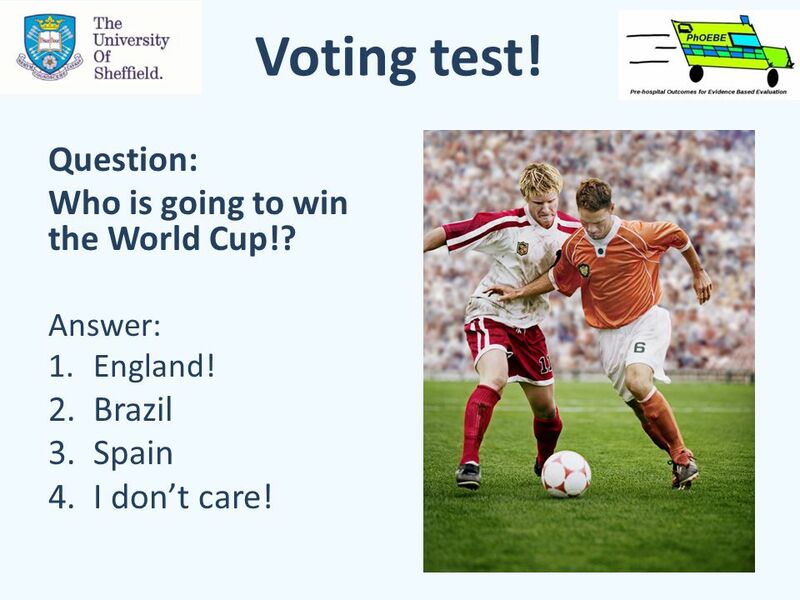 Question: Who is going to win the World Cup!? 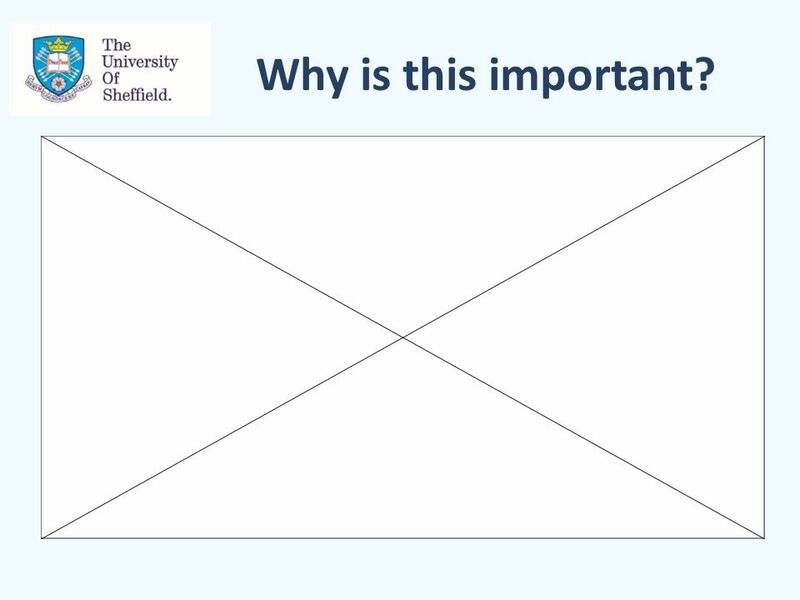 Answer: 1.England! 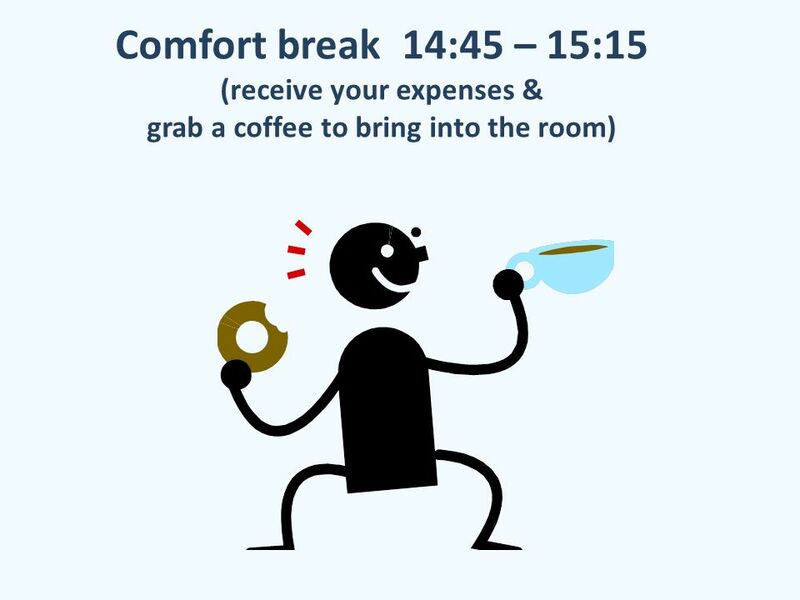 2.Brazil 3.Spain 4.I don’t care! 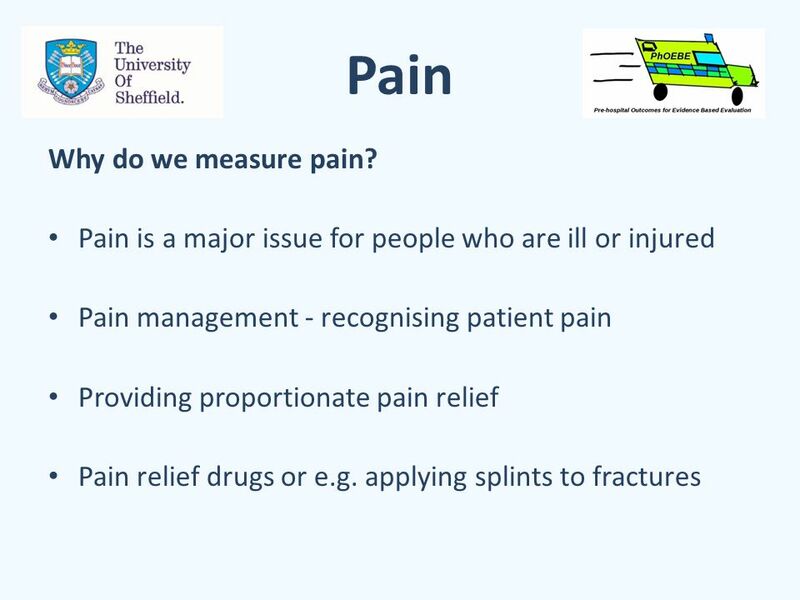 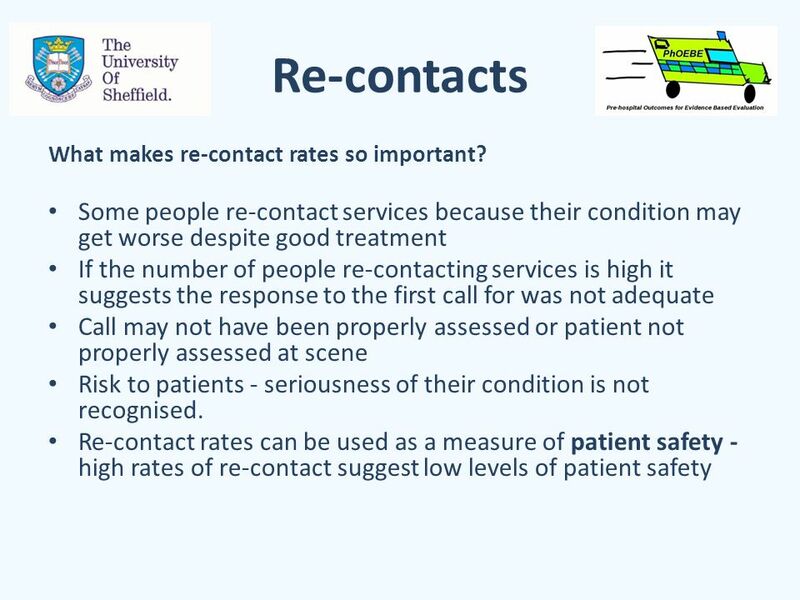 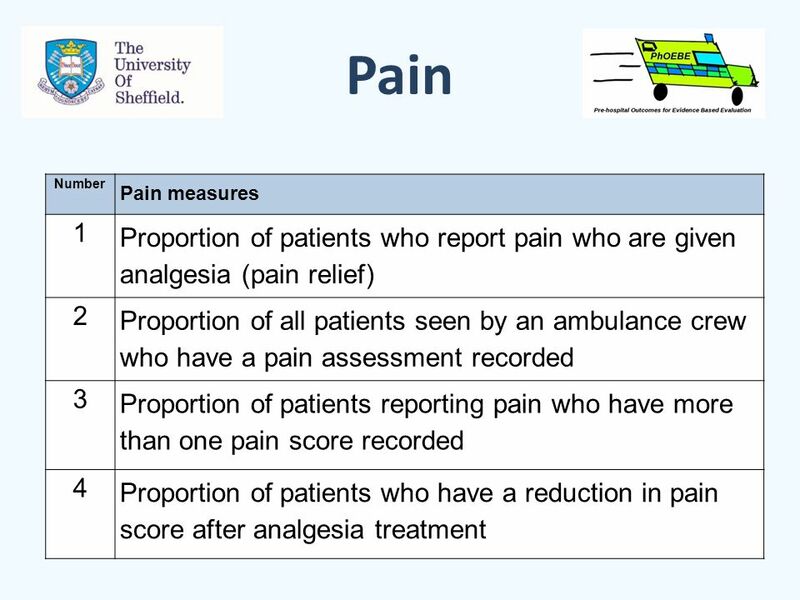 11 Patient outcome measures What are patient outcomes? 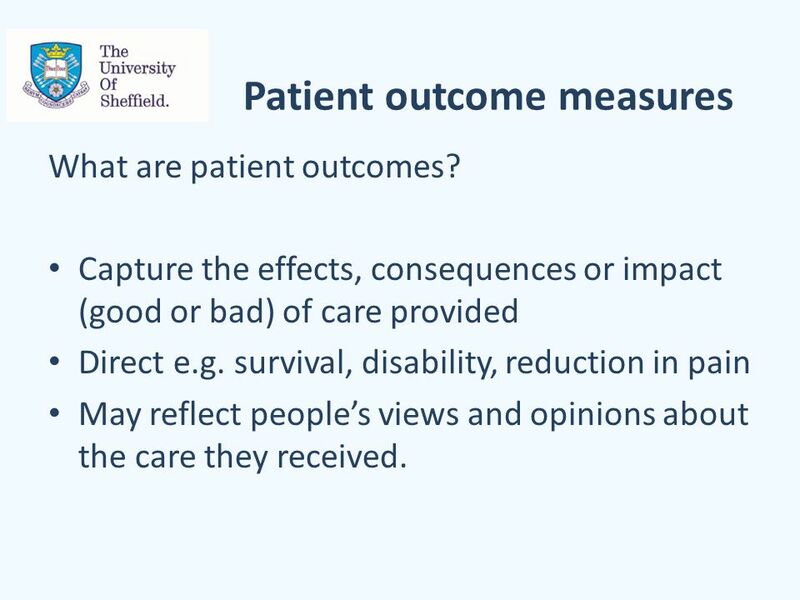 Capture the effects, consequences or impact (good or bad) of care provided Direct e.g. 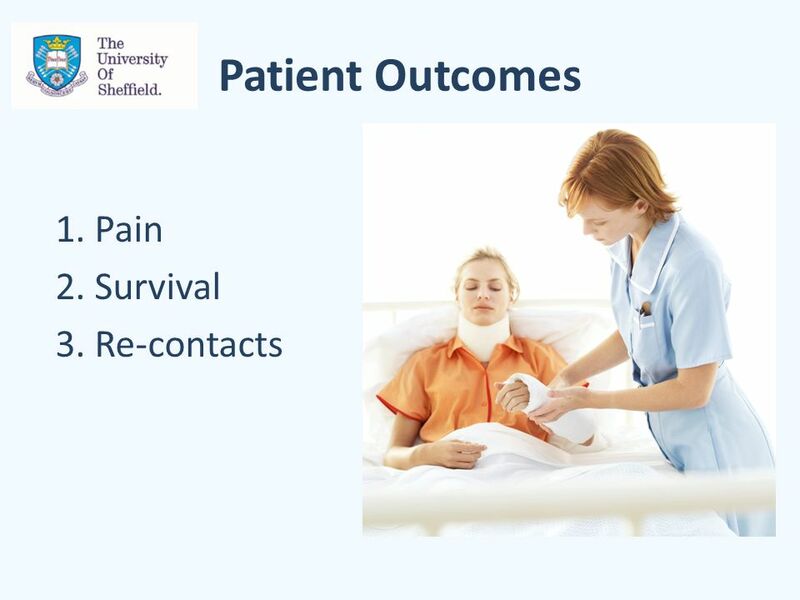 survival, disability, reduction in pain May reflect people’s views and opinions about the care they received. 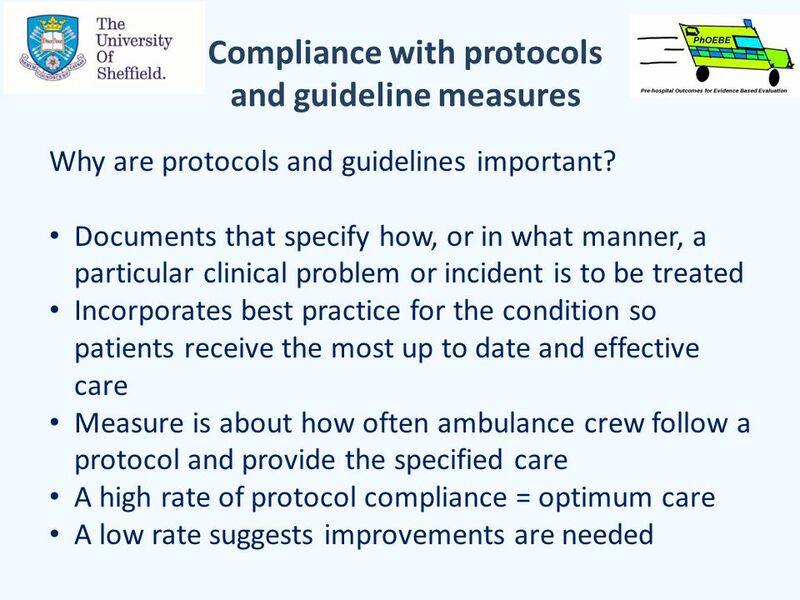 26 Compliance with protocols and guideline measures Number Compliance with protocols and guideline measures 1 Proportion of all cases with a specific condition who are treated in accordance with established protocols and guidelines, e.g. 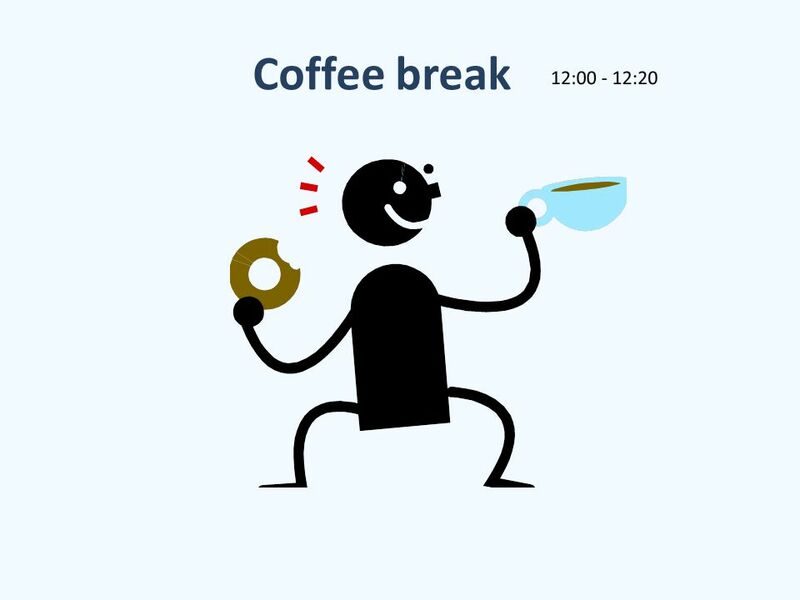 stroke, heart attack, diabetes, falls. 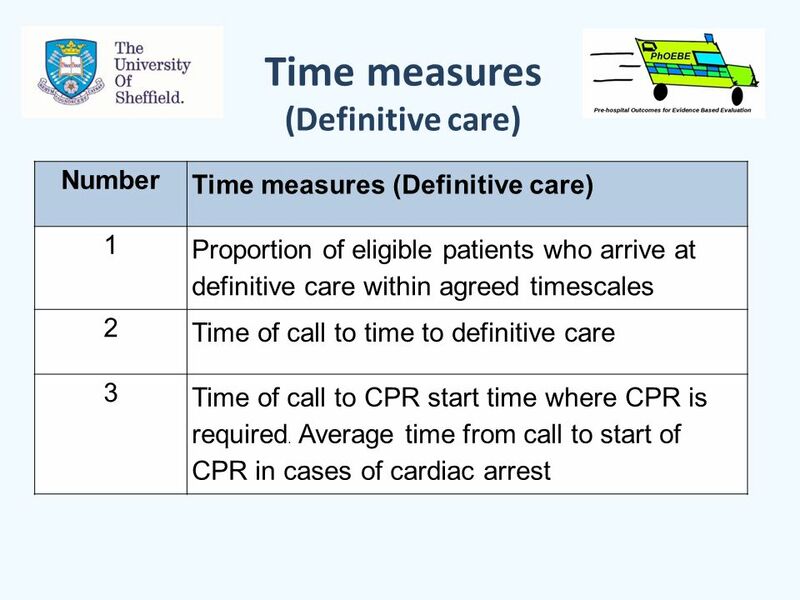 2 Proportion of cases that comply with end of life care plans where these are available. 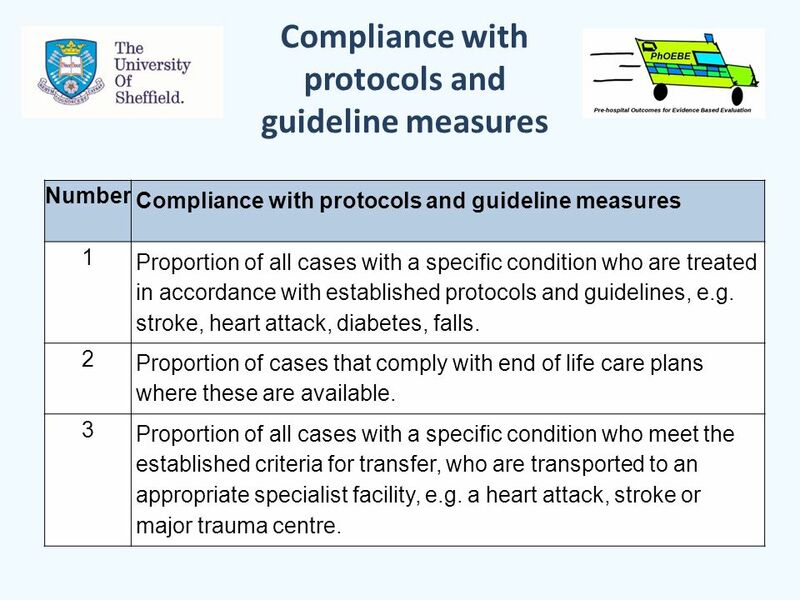 3 Proportion of all cases with a specific condition who meet the established criteria for transfer, who are transported to an appropriate specialist facility, e.g. 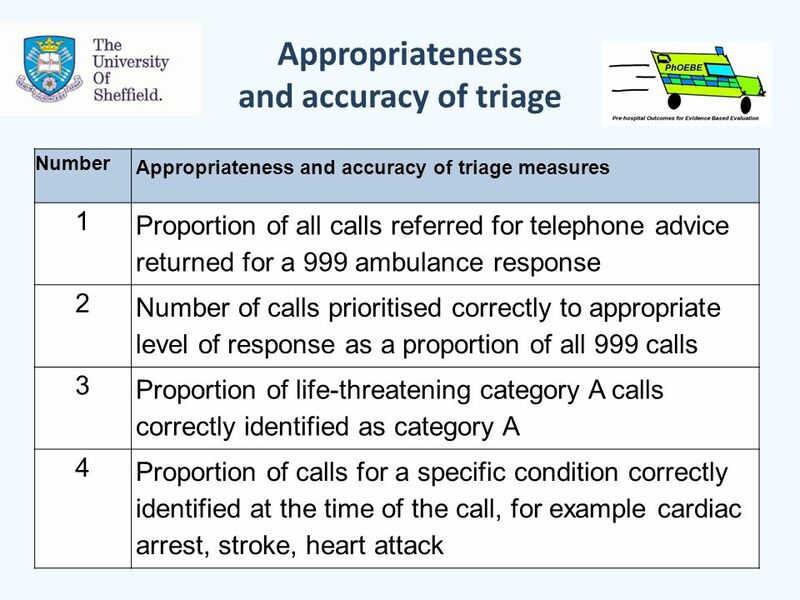 a heart attack, stroke or major trauma centre. 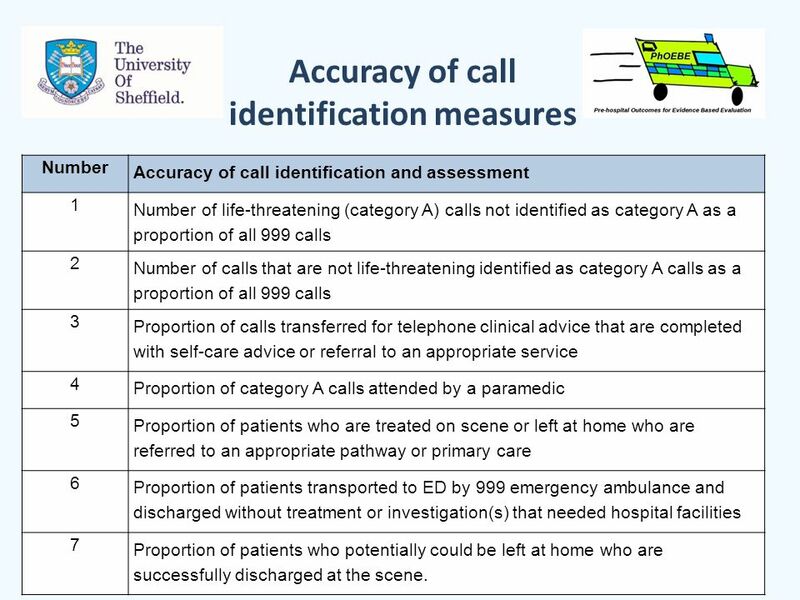 34 Accuracy of call identification measures Number Accuracy of call identification and assessment 1 Number of life-threatening (category A) calls not identified as category A as a proportion of all 999 calls 2 Number of calls that are not life-threatening identified as category A calls as a proportion of all 999 calls 3 Proportion of calls transferred for telephone clinical advice that are completed with self-care advice or referral to an appropriate service 4 Proportion of category A calls attended by a paramedic 5 Proportion of patients who are treated on scene or left at home who are referred to an appropriate pathway or primary care 6 Proportion of patients transported to ED by 999 emergency ambulance and discharged without treatment or investigation(s) that needed hospital facilities 7 Proportion of patients who potentially could be left at home who are successfully discharged at the scene. 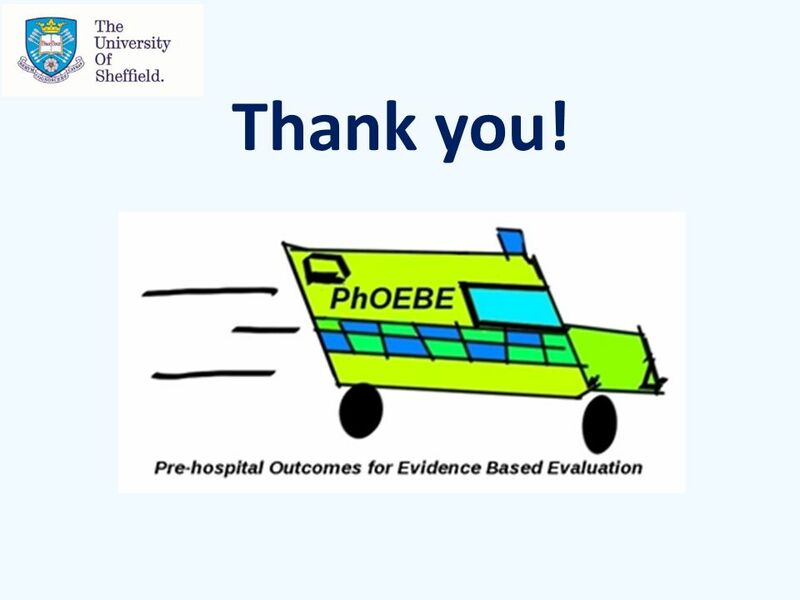 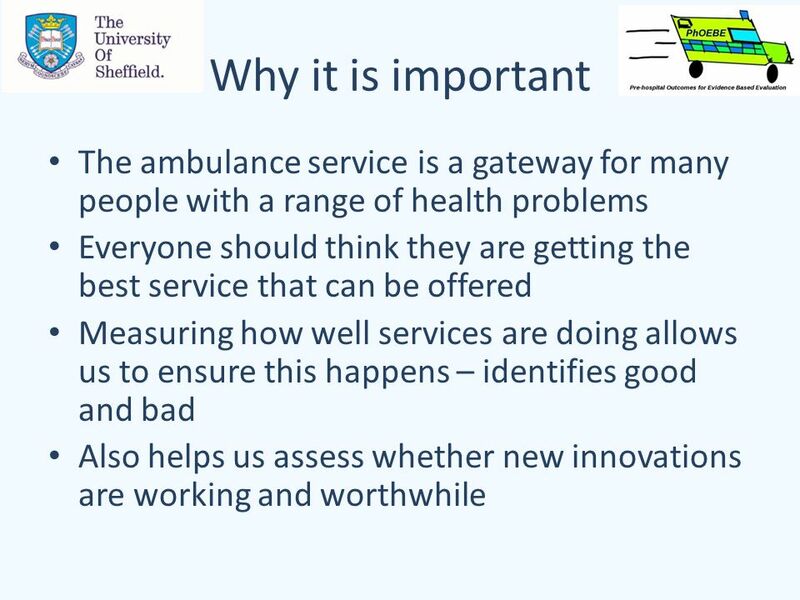 Download ppt "PhOEBE Patient and Public Involvement Day Ambulance service quality What matters to you? 4 th June 2014." 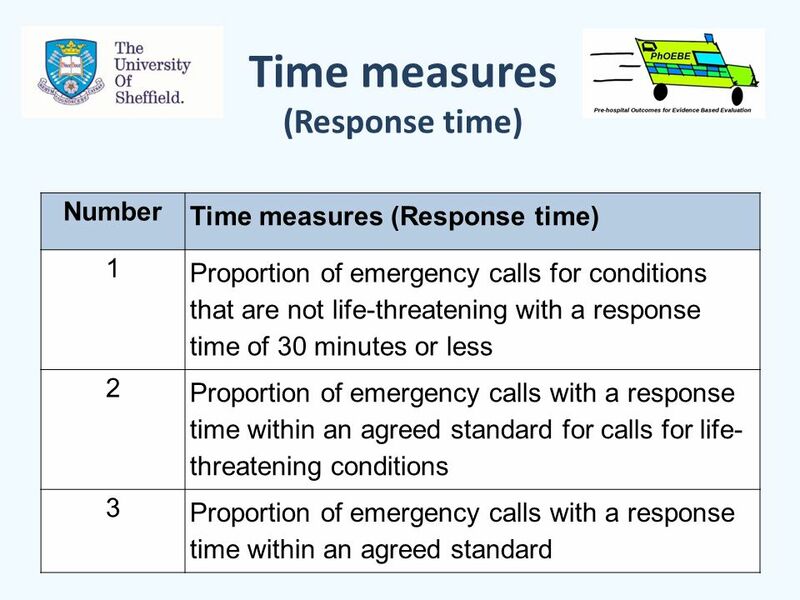 Paramedic Practitioner Support Scheme for Older People with Minor Injuries or Conditions South Yorkshire Ambulance Service NHS Trust Sheffield. 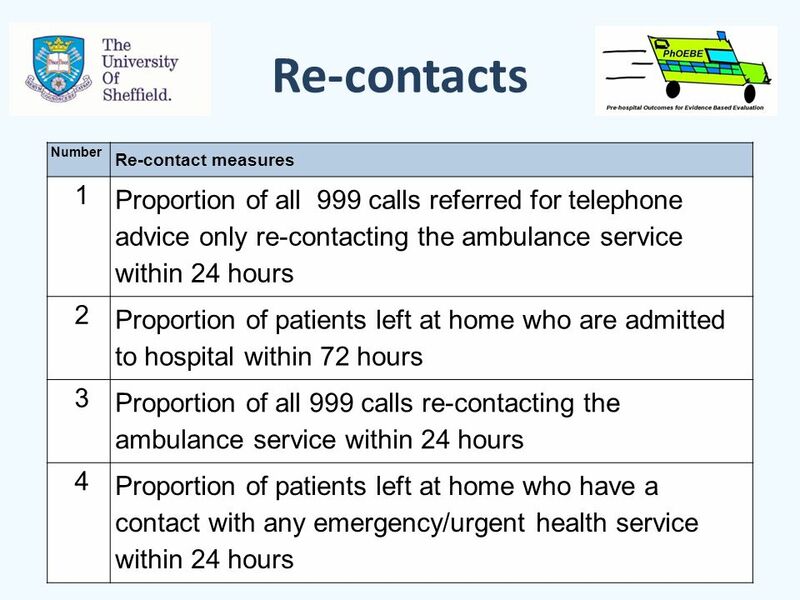 West Essex Clinical Services Review Context 5 PCTs, 1 acute Trust, across 2 SHAs 5 PCTs, 1 acute Trust, across 2 SHAs Population of approx. 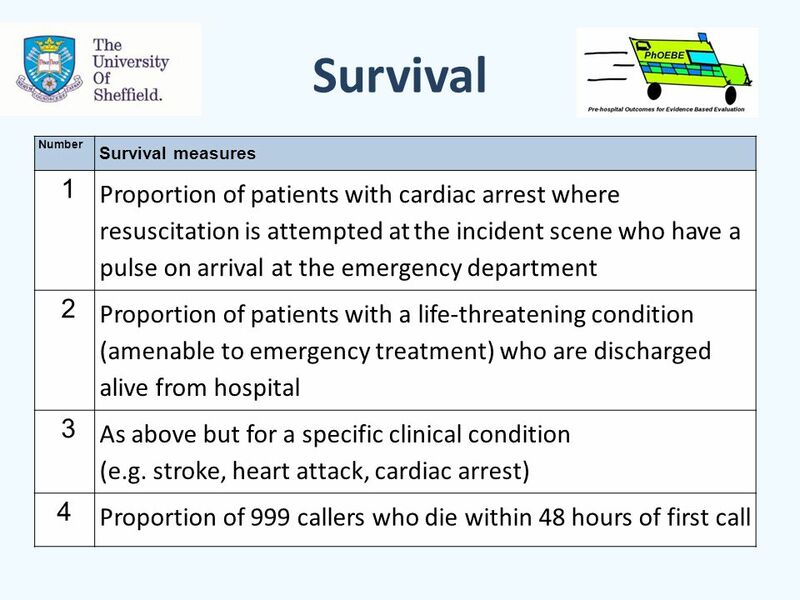 500,000 Population. 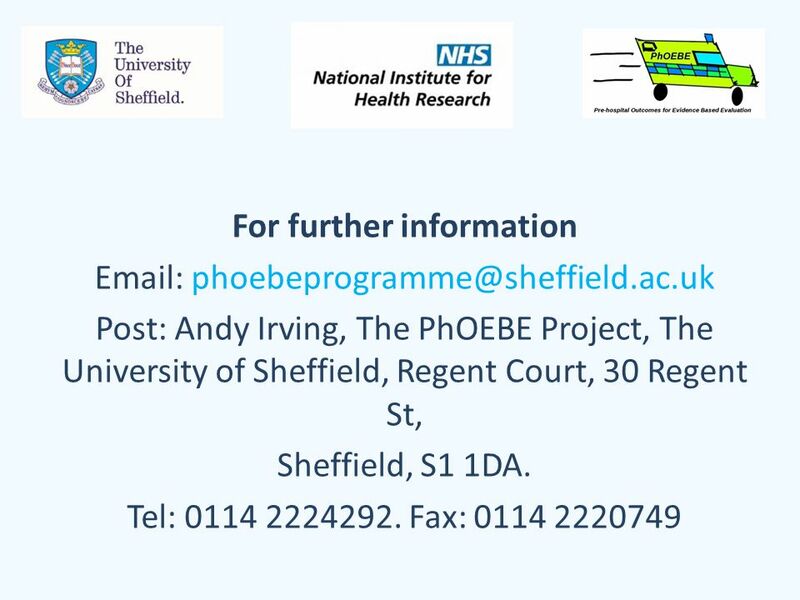 Confidential Inquiry into the deaths of people with learning disabilities Dr Pauline Heslop Manager of the Confidential Inquiry Senior Research Fellow. 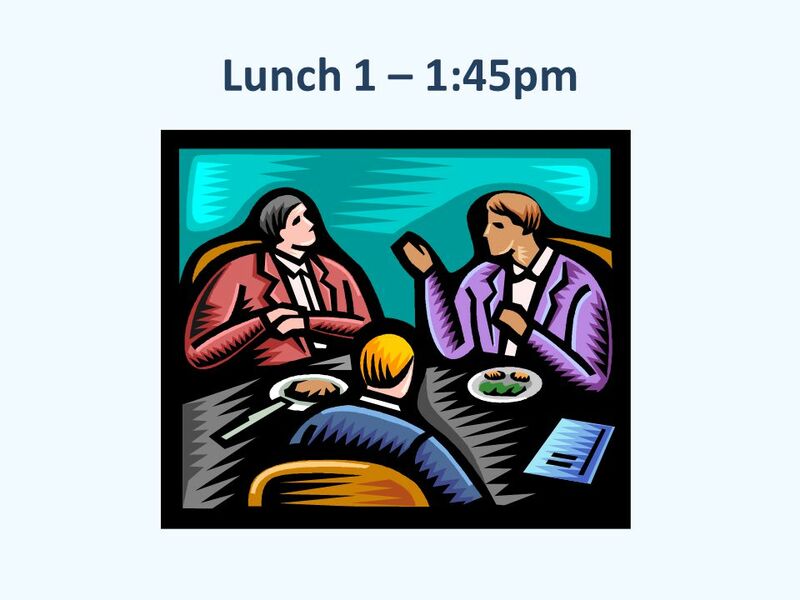 Welcome to Bradford GP Training Scheme Induction Course 9th and 10th August 2012. 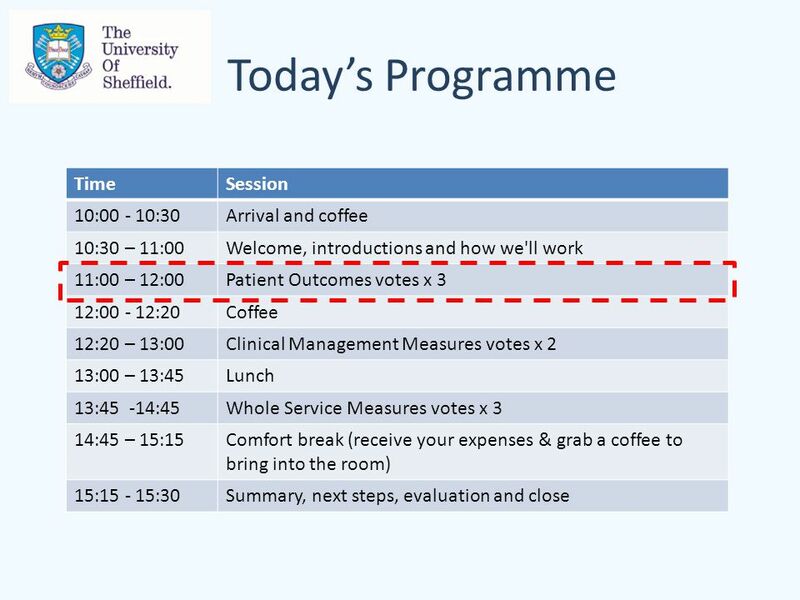 FIFE FALLS AND BONE HEALTH TRAINING INTRODUCTION Aims and objectives 9.45 – Session Presentation – Introduction to Group. 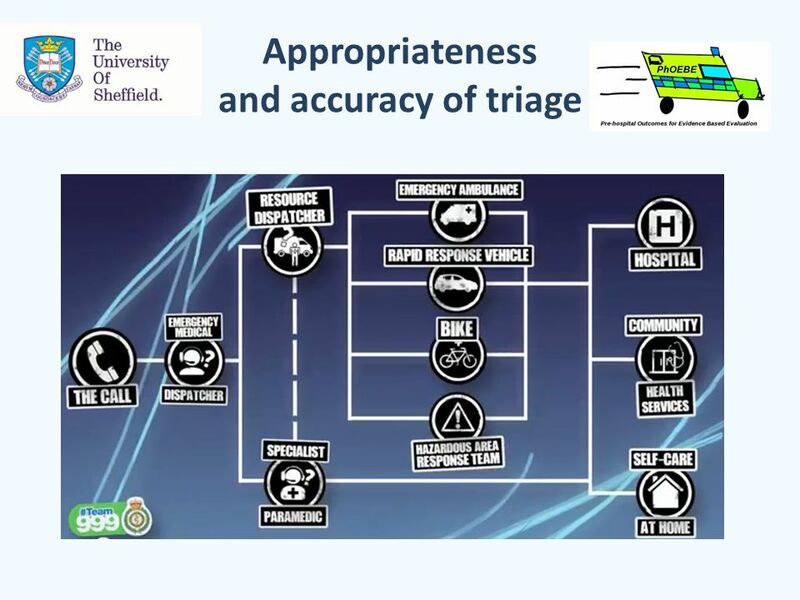 Information & Performance Cells. 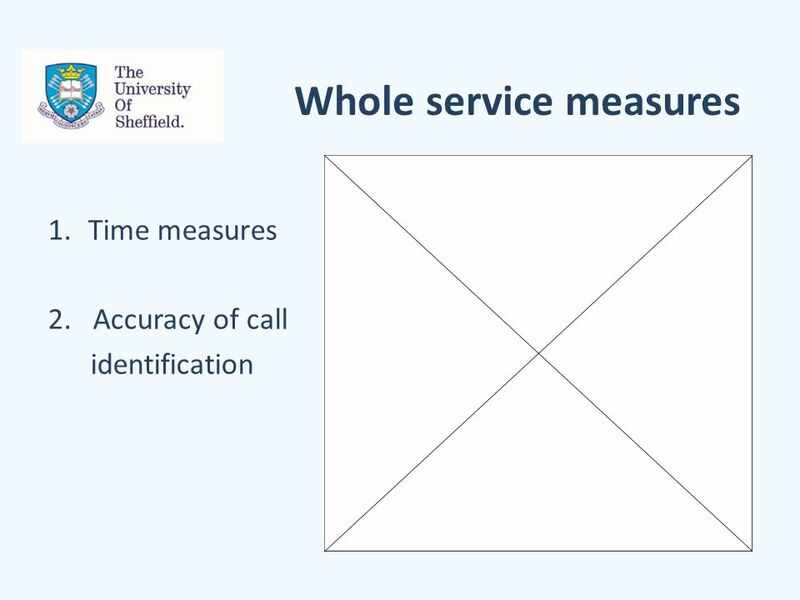 Performance Cell Who are we? 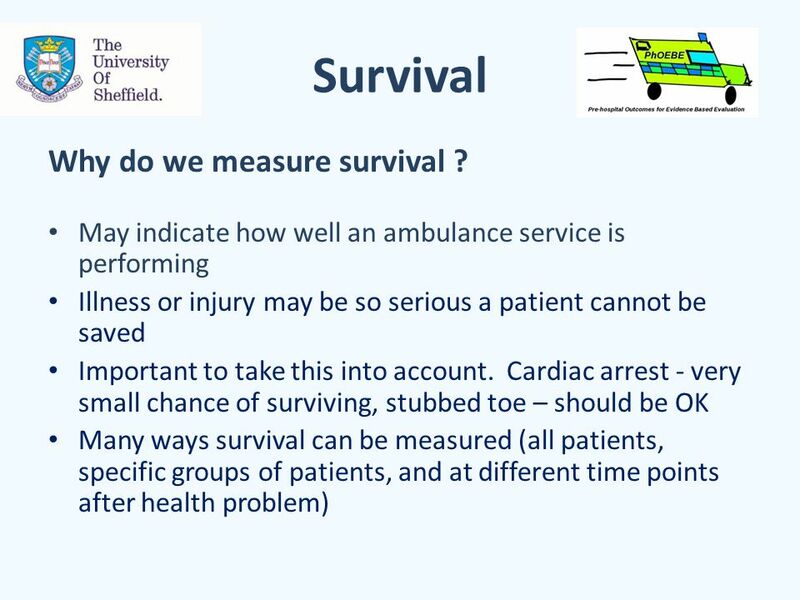 West Midlands Ambulance Service NHS Foundation Trust 5.4 million population Over 5000 square. 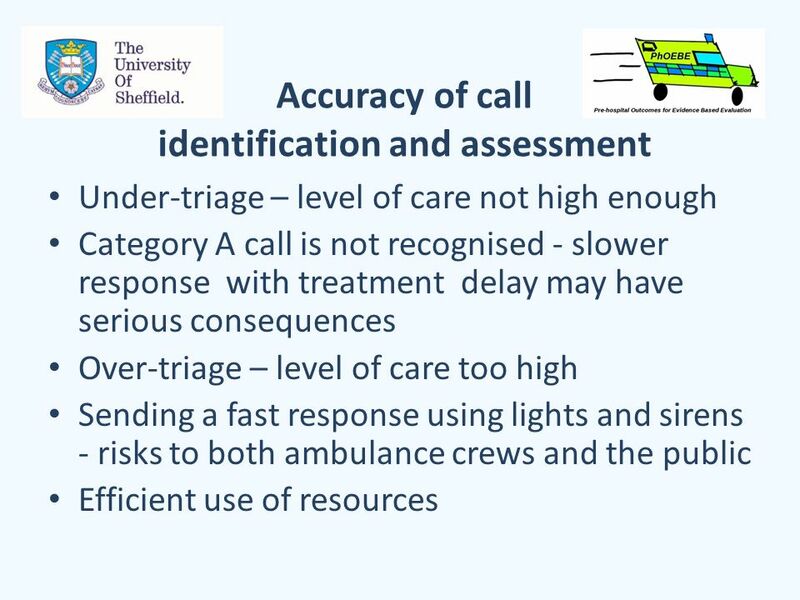 Seven Day Services Cost-Benefit Analysis - Approach and Key Issues David Halsall Clinical Quality and Efficiency Analytical Team 20 th January 2012. 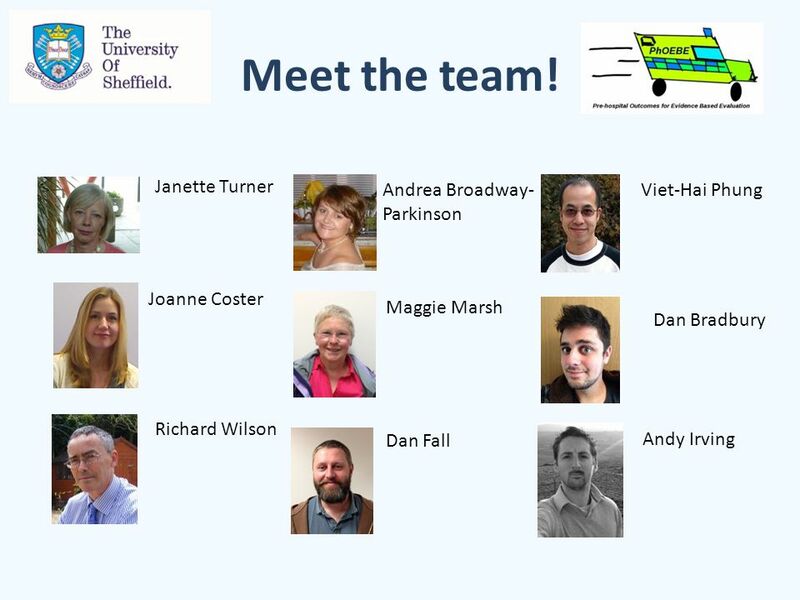 CHILDREN AND YOUNG PEOPLE’S HEALTH SUPPORT GROUP Unscheduled Care Helen Maitland National Lead.